“I am deeply disturbed that Iran continues to implement the death penalty against juvenile offenders, with some 85 others reportedly on death row," UN High Commissioner for Human Rights Zeid Ra’ad Al Hussein said on Thursday. Fifteen-year-old Abolfazi Chezani Sharahi was executed after being found guilty of fatally stabbing a man. A total of five juvenile offenders were executed in the country during 2017. 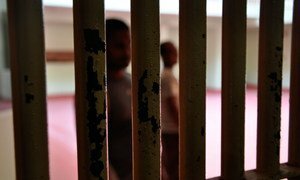 "We understand that the execution of at least one more juvenile offender, Mohammad Kalhori, is imminent and urge the authorities not to carry it out, but instead to commute the sentences of all juvenile offenders on death row," urged Zeid. Executing juvenile offenders is in violation of Iran’s obligations as a State party to the Convention on the Rights of the Child and the International Covenant on Civil and Political Rights. The youth was moved into solitary confinement four times before his eventual execution, further opening up the possibility that he suffered torture, or cruel, inhuman or degrading treatment or punishment. The High Commissioner also expressed concern over the lack of transparency prior to implementing the death penalty. When authorities fail to provide relatives with adequate information about the timing of executions, it not only imposes acute mental distress on the convicted person, but also on their family. Zeid also reiterated the UN Human Rights Office's willingness to assist Iran in complying with its international human rights obligations regarding juvenile justice.